When Lucy discovers that Ricky's name is misspelled (Bicardi) on their marriage license, she concludes their vows are invalid. She returns from City Hall, via East Orange, New Jersey, despondent: "We've been revoked." Now she wants to recreate the entire courtship and ceremony, with plans to go to the Byram River Beagle Club in Greenwich, Connecticut. They head for New England where Lucy finds the exact spot where Ricky proposed to her in 1940. Against his better judgment, Ricky gets down on his knees to propose, while Lucy feeds him the antedated dialogue. They run out of gas, whereupon they wander into the Eagle Hotel run by Bert Willoughby and his wife. The former just happens to be the town's justice of the peace and can perform the marriage ceremony for them. After "Mother" Willoughby sings the appropriate, if off-key, "I Love You Truly," vows are exchanged, and the Ricardos are married, for a second time. Special Notes: This episode was the first show to be seen in 10 million U.S. homes. Lucille Ball and Desi Arnaz really were married in 1940 at the Byram River Beagle Club, and also reenacted their vows in 1949 in a Catholic ceremony. Lucy Ricardo's maiden name was Lucille Esmerelda McGillicuddy. Irving Bacon later played Ethel Mertz's father in Episode #113 and Elizabeth Patterson was hired a year after this episode was filmed to essay the recurring role of Mrs. Trumbull, the Ricardos' elderly neighbor. 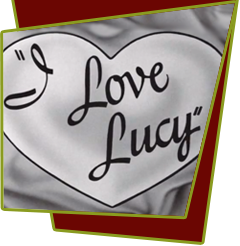 This episode is based on lucy's radio show, My Favorite Husband, Episode #28, "Marriage License Error". Bloopers: If you look close you can see a picture of Lucy & Desi when they first wed.